I found out about this book by Ken Puddicombe on Rosaliene Bacchus’ blog – Three Worlds One Vision. Read her fantastic review of this book – Down Independence Boulevard and Other Stories by Ken Puddicombe. I wanted to read this book since its based in Guyana and the steady diet of American/British based novels was getting too boring. I am glad I read the book because it has given me an idea for a book of my own. I don’t like short stories – so I never buy a short story collection by any author, but this book is very interesting because its a series of short stories that are all interlinked. Just loved that style. I learnt a lot of new things – the presence of Indians in Guyana for one. I knew that there were Indians in the West Indies because some of them play for the West Indies cricket team but the fact that they were a large part of the population and were involved in some ethnic riots is new information. The other new thing was how Guyana struggled for independence from the British empire. The British empire has sowed the seeds of communal riots and ethnic clashes wherever they have ruled.. and the former colonies are still paying a huge price. India certainly is and it seems as though Guyana is too. “Death rather than communism” – one of the placards that some of the rioters were carrying. I am reading this book titled “Confessions of an economic hit man” by John Perkins and he speaks about how the US used the bogey of communism to further its own business houses and ensnare developing nations in a web of debt. Well they seem to have done a great job of it ! “… a house is not a home if you have to look over your shoulders all the time, not if your life is in danger.” – so true, isn’t it? If you don’t feel safe in your home then its not home. “Freedom never comes without a fight, and sometimes the country pays a steep price. That’s how it was in Kenya and India.” Well, tell me about it. We are still paying a steep price – the religious divide, the language divide and well, the colonists broke us up into three countries :(. “We should call it a RIF, a Reduction in Force to meet deteriorating market conditions worldwide.” – Fascinating to see outsourcing from the other side. India benefited from outsourcing and still is but the RIF is becoming very common here as well. Muni’s thought – “Too young to retire, too old to hire”. We have several people in that state because young people are available in huge numbers and cost lesser to hire. Sad, but true. “Funerals are not for the dead – they are for the living to celebrate a person’s life.” You bet. Just completed all the ceremonies for my mother-in-law who passed away on the 8th of June and she is probably beyond caring about how she is remembered but for all of us left behind, her memories are a way to celebrate her life. Do read this book. Its definitely worth the time and it gives you a glimpse into a different culture and challenges a country faced as it gained independence. Ken Puddicombe – awesome piece of work. Bindu, I’m so glad that you’ve enjoyed Puddicombe’s short story collection and have taken the time to write your own review. I loved “Confessions of an Economic Hit Man.” Am looking forward to your opinion of it. Katharine, am just completing the book. Will soon write my review … one line review – “its an eye opener”. You were the one to suggest it so thanks for a great suggestion. I am infact reading the updated “New Confessions of an Economic Hit Man”. He wrote it in 2015 I think. Bindu, It was an eye opener for me, too. I didn’t remember suggesting it, but hope it was worthwhile for you. NO better reward for a writer than to see his work acknowledged! 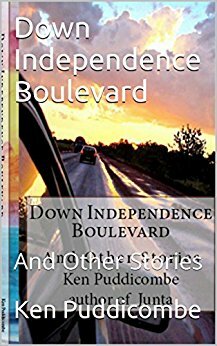 “Down Independence Boulevard” is an amazing first collection of short stories and Ken Puddicombe’s remarkable story telling. “Black Friday” left me with sadness; “The Family Photograph” brought a smile to my face, but “The Last Straw” has to be my favourite, as I am left imagining what Raj did about the missing part of his moustache (!) and hoping that Zorina was able to have a successful and happier life, but then I am continuing in my mind what was only a story, but such a good one!